First off, let’s observe the custom pickups that are sold by EVH Gear. The first is the EVH® Frankenstein™ Humbucker Pickup. Retailing at $200 US, this is a modern day replica of the Frankenstrat humbucker pickup which is designed to the specifics of the original pickup used in the Frankenstrat by Eddie himself. Not bad considering that in most people’s budgets the Frankenstrat Replica is way out of the ordinary price range of many people’s budgets. The EVH Gear Pickups on sale are worth the money if you cannot afford an EVH Wolfgang yourself, and you wish to buy something that can be installed into your guitar to get closer to the Van Halen sound. There are also some other alternatives for EVH Gear pickups. There is also the same pickup presently being marketed with a Chrome Cover with a limited edition run of 200, retailing also at $200 US for those who prefer that sort of thing. Also available in the range of custom made pickups are the EVH® Wolfgang® Bridge and Neck humbucker pickups (no single coil pickups available for purchase) for installation into any guitar. These are the primary pickups that are placed directly into the main line of EVH Wolfgang guitars. The pickups individually retail at $200 US. 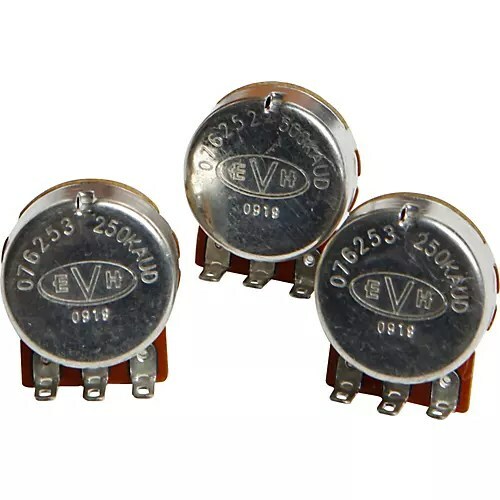 For those who desire an even cheaper way to customise the sound of the electric guitar, there are also EVH® Custom Potentiometers. For those of you unaware of what these are, they are used underneath the tone and volume knobs to “shape” the sound. For $15 US per set, you can choose from 250K low friction, 500K low friction or 250K High Friction pots. Given the price of these, this is an excellent way to “hotrod” your own electric guitar, EVH style. The EVH Gear custom potentiometers are another great option to consider from EVH Gear itself. One of the more interesting trends amongst guitar amplification companies in modern times is to sell so-called “Micro” amps. Many companies such as Marshall, Blackstar, Vox and Fender themselves have successfully marketed these amplifiers that are so small that they can be taken virtually anywhere with ease. 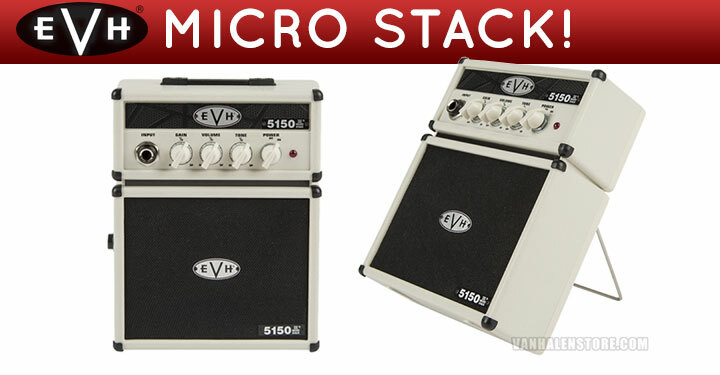 So in a good effort of marketing and thought, EVH Gear made the 5150 III® Micro Stack. The option of purchasing an EVH Gear Micro Stack is a good idea for one who wants a cheap, affordable and portable option of the latest line of EVH Gear amplifiers. If you are looking for a small and affordable way to hear the 5150 III, this amp may be your best bet. Another interesting product for sale is the previously mentioned product on this website called the D-Tuna. Eddie Van Halen has previously used this on both the Ernie Ball Music Man and Peavey guitar line of guitars that he marketed, and is a simple and useful addition onto the Floyd Rose tremolo system. For sale for $60 US, it comes in three different colours for the guitar respectively. Since the early days of Van Halen, Eddie himself has gone to curious methods to create guitar strings that are highly personalised and branded to his own nature of playing. From the very early days boiling a mixture of Fender electric guitar strings, to the latest EVH branded guitar strings, which are Nickel Plated Steel strings, Eddie has made a good effort into the use of guitar strings. 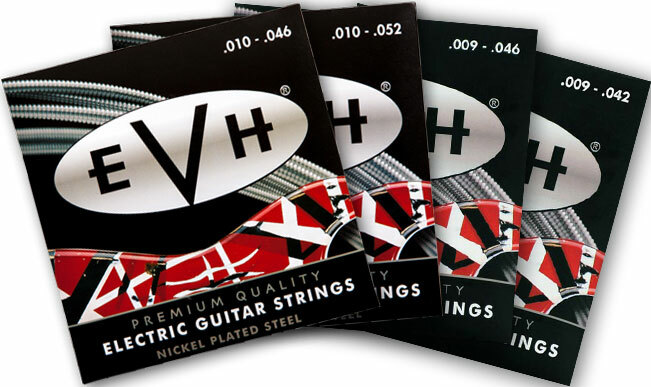 With the EVH® Premium Strings, retailing at $13 US a packet, one can find the modern day electric guitar strings that Eddie himself uses on his EVH Wolfgang guitars. Bear in mind that Eddie uses 9-46 string gauge on his guitars, a must to remember to get the specific feel of Eddie’s playing. Other string gauges include 9-42, 10-52 and 10-56. Trying a set of EVH Gear strings is a good and cheap way of testing out what Eddie Van Halen himself uses currently. For a cable to carry the signal from the guitar to the amplifier, EVH Gear do market and sell a 6” R to R cable that Eddie Van Halen uses himself in his guitars. It is a 24 gauge copper cable with double shielding for extra protection of the cable itself. Retailing at $40 US, it is an affordable way of finding a cable that could work for the guitarist. 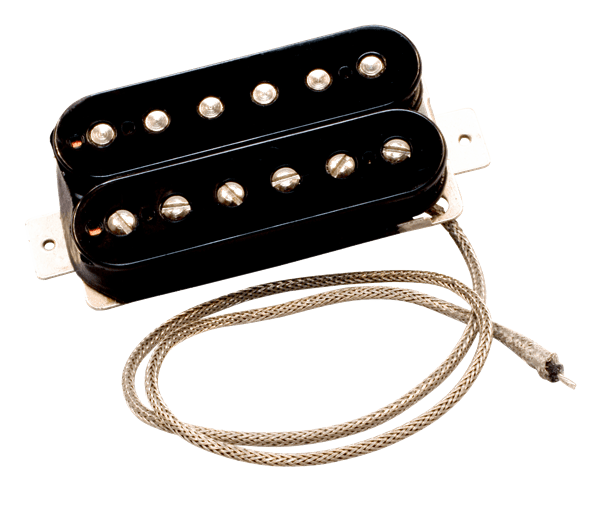 Alternatively there are other cables from the EVH® Premium Cables line ranging from $20 US to $40 US marketed and made in a similar way to the 6” R to R cable. For those playing gigs and live performances, there are straps available for the guitarist. The regular strap is priced at $60 US whilst the Nylon strap is priced at $35 US. Picks, anyone? For those who enjoy collecting various plectrums and brands of plectrums, the array of plectrums available from EVH Gear should be worth considering. For those who do really wish to chase bargains of the EVH Gear sort, there are Eddie Van Halen custom plectrums (aka Picks) for one to purchase. 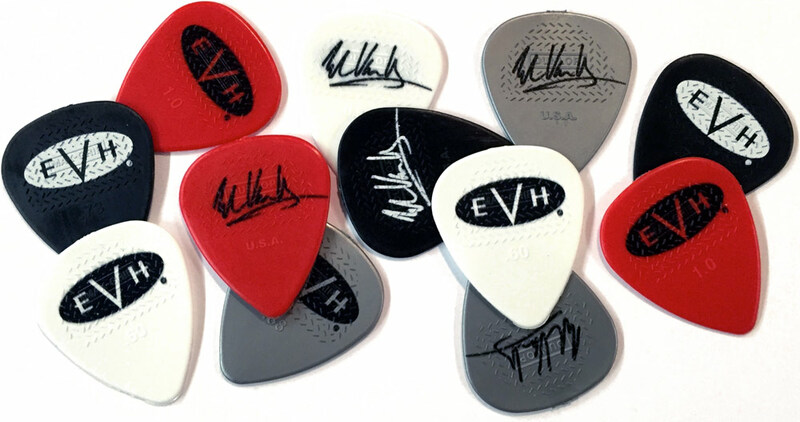 For an EVH® Premium Pick Tin, including 12 plectrums, is worth $12 US. Alternatively there are individual plectrums to buy, starting from $6 US for a small set. These are made by Dunlop with a special grip on the plectrums, as well as coming in a variety of thicknesses for the player. Lastly, there are two different types of gig bags available for those who are interested. Featuring waterproof padding and a black exterior and red interior, the price of a gig bag is $100 US. Also for the star shaped guitars, there is another slightly different shaped gig bag also selling for $100 US. All in all, these are some rather interesting, relatively affordable and varied accessories to choose from if you are a Van Halen fan. Certainly worth checking out as well if you are a fan of not just Eddie Van Halen, but EVH Gear as well. Eddie Van Halen certainly has approached the broad variety of products available under the EVH Gear name very well. This entry was posted in Guitar, Music, Rock, Sound, Technology, Uncategorized, Van Halen and tagged Brown Sound, Eddie Van Halen, Electric Guitar, EVHGear, Fender, Gear, Setup, Sound, Van Halen on September 20, 2016 by chrisairey01. Understandably Eddie Van Halen, after leaving Peavey, needed to work together with Fender on a line-up of amplifiers that were more modern and that would do the job for him on the road. Released around the same time as the EVH Wolfgang, the 5150 III amps are arguably one of the heaviest sounding amps on the market, ideal for a variety of metal style sounds and output. This amp is a powerful piece of equipment, one which Eddie Van Halen himself has stuck by. No doubt Eddie Van Halen and Chip Ellis of Fender put their best efforts into creating the EVH 5150 III. Eddie himself uses the all-tube amp, using eight 12AX7 and six 6L6 tubes. On each amp, and specifically Eddie’s amp, there are three channels of output: Clean, Crunch and Lead. To get a good idea of what Eddie uses, we will observe the stats of the 5150 III® 4×12 Straight Cabinet and the 5150 III® 100W Head. The Cabinet itself is valued at around $1,333.32 US and the head is valued at around $2,399.99 US, in itself, not cheap. But since the release of the original 5150 III amplifiers, there have been a variety of models released for the gigging and home musician. The EVH 5150 III was modeled heavily on the original Marshall Superlead that Eddie himself had used for many years. Included Accessories: Removable Casters Included. Controls: Gain, Low, Mid, High, Volume, Channel Select, and Presence for each Channel. 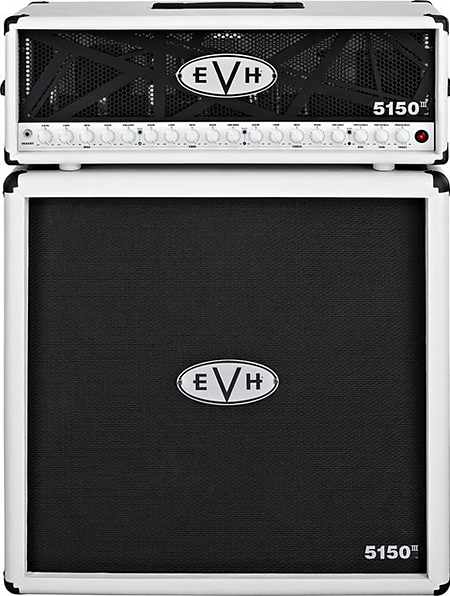 There are many different models of EVH 5150 III amplifiers out there on the market. This is merely just a sample of what one can purchase if one desires and a good way to follow the modern Van Halen amplified sound. The EVH 5150 III is a perfect selection for the metal players out there. This entry was posted in Guitar, Music, Rock, Sound, Technology, Uncategorized, Van Halen and tagged Brown Sound, Eddie Van Halen, Electric Guitar, EVHGear, Fender, Gear, Music, Rock, Setup, Sound on September 13, 2016 by chrisairey01. Now that Eddie Van Halen was working together with Fender on various products, it was time for him to work hard with Fender on creating a brand new guitar to sell and market under the EVH Brand. To begin with, discussions were made with Fender about making a new guitar for Eddie. 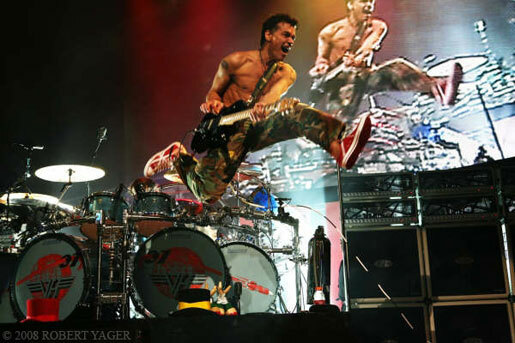 Once the 2007-2008 reunion tour was underway, Eddie Van Halen took at least two prototypes of the new collaborative guitar that he was working on with Fender. He gave Fender feedback and information about the sound and performance of this new project that he had been working on with them along the way after each night of performance onstage. This project was almost top secret, until the release of the EVH Wolfgang in January 2009. The clever thing about the new prototypes from Fender? Similar look to the previous Peavey Wolfgang line of guitars. To make things clear, this guitar, although sharing the name of the previous guitar line that Eddie Van Halen had promoted and used for some time, in actual reality the guitar itself is completely different in many aspects. 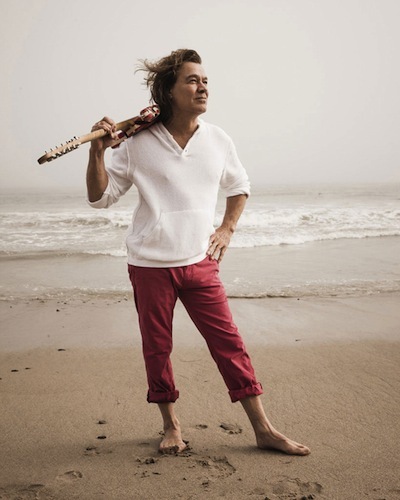 In a video recorded around the time of the release of the guitar, Eddie Van Halen had a discussion where he stated, “Everything that I have built, destroyed, stumbled onto, learned and experienced is in this guitar”. Indeed, the guitar itself is a one-of-a-kind and is basically impossible to copy. Indeed, if Eddie himself had desired to create a monster, he indeed, has. 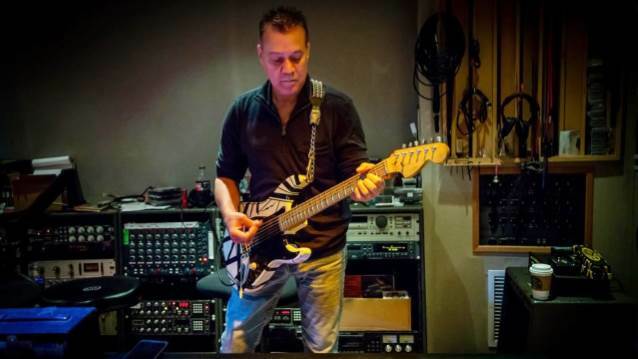 The guitar line itself has been one that Eddie Van Halen himself has stuck by for a long time now. 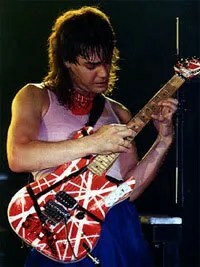 Although initially there was only one type of EVH Wolfgang, other models were introduced at a later date. For historical purposes, the main Wolfgang model will be observed here. The EVH/Fender Wolfgang is here to stay. In short, if you are looking for the main go-to guitar that Eddie Van Halen himself has used in the most recent times, look no further than the main Wolfgang USA that is on sale for around $4,000 US from EVH Gear, depending on the colour. This is the main guitar that Eddie himself uses to this day. Eddie Van Halen loves the good job that Fender did for his latest line of guitars, and the easygoing relations commercially shows in both of their own outlook with each other. This entry was posted in Guitar, Music, Rock, Sound, Technology, Uncategorized, Van Halen and tagged Brown Sound, Eddie Van Halen, Electric Guitar, EVHGear, Fender, Floyd Rose, Gear, Music, Rock, Setup, Sound, Van Halen on May 26, 2016 by chrisairey01. Shortly after Eddie Van Halen signed up with Fender, Fender took over Charvel’s striped series and made it into their own through the EVH Gear company. The interesting thing about these guitars is that Charvel only offered three different versions for the time that Eddie was licensing Charvel to sell these guitars, based on the previous guitars that Ed had used, namely the Frankenstrat Mark I and II, and also the Bumblebee guitar. Yet in recent times (around 2015) the EVH Striped Series Star and Striped Series Circles were released as well. The latter two guitars were based on guitars that Eddie Van Halen had built himself many years ago, and are relatively affordable collector’s items today. The EVH/Fender Striped Series guitars go way back into the history of Van Halen. Each guitar is rather cheap for a unique piece of kit. The guitars go up to the max of around $1,500.00 US each and all are beautiful and simple, with a powerful pickup in the bridge position. There is a good variety of different EVH/Fender Striped Series models to choose from, depending on your taste. Unique Features: EVH® Neckplate, Bar String Retainer, Thumb Wheel Truss Rod Adjustment, Vintage Strap Buttons, 1-Ply Black Pickguard on Black and White Model Only. The EVH/Fender Striped Series Circles guitar was based on the original “Unchained” guitar that Eddie Van Halen specifically built and recorded that song with. There is just something genius-like and amazing about the various EVH/Fender Striped Series Models. From a collector’s point of view, these guitars are not just simply playable, but worth your money. If you are a fan of Eddie Van Halen and want to embrace a piece of your own artistic value, the EVH Striped Series is the way to go. The Eddie Van Halen collaboration with Fender has been nothing but wonderful. This entry was posted in Guitar, Music, Rock, Sound, Uncategorized, Van Halen and tagged Eddie Van Halen, Electric Guitar, EVHGear, Fender, Floyd Rose, Gear, Setup, Sound on May 20, 2016 by chrisairey01.